Tamayura Hitotose, episode 9 was funny. Momoneko (literally “peach cat”), the pink cat doesn’t look like a cat at all. Its gender is revealed to be male. Yes, Momoneko is a guardian of Takehara. In Takehara farming fields, potatoes are eaten by the wild boar. 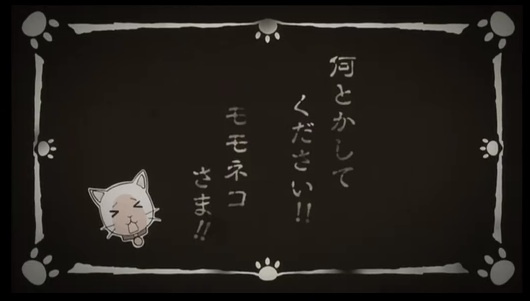 So, a cute female cat asks Momoneko-sama to fight the boar. 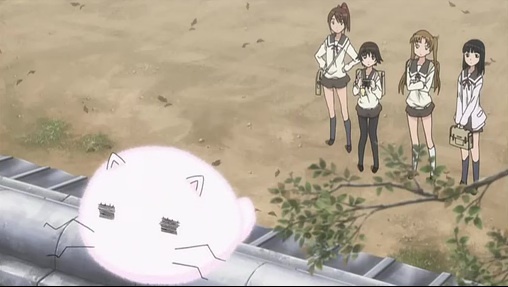 But the boar is too strong, Momoneko doesn’t stand a chance. Ah, a cute girl asks you to do something, even that’s life or death situation, I think any guy will feel pressured to say “yes.” First of all, he ran away, but with a little help of his friends, he becomes a hero of the town! Yes, in Egypt, cats were considered to be god. The burial sites are often excavated with cat bodies. Cats were eating mice, so the harvest wouldn’t get wasted. Cats were the protector of human food. Yes, just like cats earned the status of god in Egypt, now Momoneko has earned the title of the guardian of Takehara! Indeed Takehara’s mascot! And this narrative was done in silent film style. The dialogue was very funny! Haha. The funniest fable I’ve ever seen! The wild boar probably represents the mountain spirit, before the Japanese adopted the rice diet, they ate crops from the slash and burn farming. But domesticated cats now protect the human world. 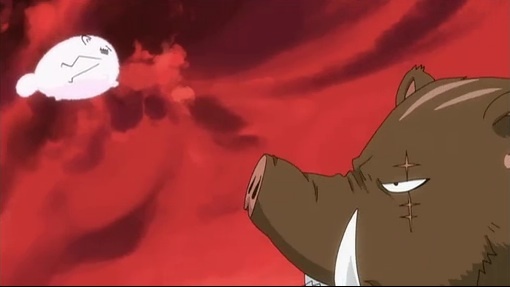 And now the boars are domesticated, becomes pink = pig. Pink is a color of domestication, still feminine color, home economics. “Eco” came from oikos (home, house) in Greek, so home economics is eco-economics. Very tautological. Indeed real economics. The Economics! Economists are using GDP (gross domestic product) instead of GNP (gross national product). It’s domestic, stupid! Yes, homemaking, housekeeping, all eco. Male home economist is butler and female is maid. Kaseishi (家政士) is home economist and kaseifu (家政婦) is maid. Being eco is green, but also pink. So the most eco friendly profession is maid! And the most pink is hikikomori/NEET, the super domestic hero! The most pink = the most heroic! Momo (peach). Momo-iro (pink). Momo is moe tree. Tree of omen (桃) is tree of moe (萌え木). Kizashi (omen) is 萌し, 兆し. So yes, moe! Grain god is fox. Grain god is canine. So, momo god is feline. Jesus is a lamb, so Christian god is ovine. 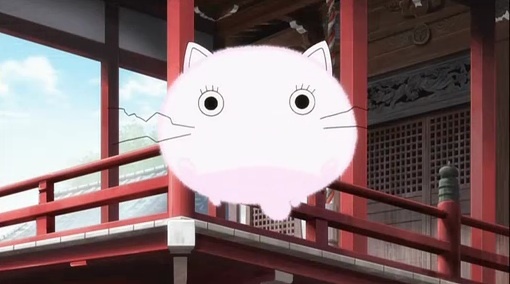 Momoneko is momo-tama (桃魂 pink spirit or peach spirit) just like Gin-tama (銀魂 silver spirit). Gintarou (銀太郎), aka Sakata Gintoki (坂田銀時), but traditionally Sakata Kintoki (坂田金時), aka Kintarou (金太郎). Kintama (金魂 golden spirit). And alternatively Kintama (金玉 golden balls = testicles). Kintarou defeats the bear, a mountain spirit, and makes it domesticated. A hero conquering the wild nature. Sakata Momotoki (坂田桃時), aka Momotarou (桃太郎). Tamayura’s Pink Panther is Momoneko-sama! Thus, one day I should go to Takehara to worship Momoneko-sama!